"Remembrance is the secret to Redemption" - Baal Shem Tov. With the passing of the Shoah generation, American Holocaust Memorializations in synagogues, cemeteries and communities are passing into the fog of historical forgetfulness. The major memorials have been documented and photographed though not catalogued. 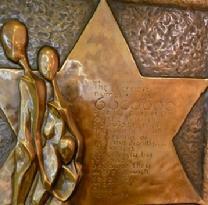 Local and small community Holocaust memorials have not been photographically documented, catalogued or archived. Preserving the Memory, as a special project of www.JASHP.org, is attempting to fill the need. The Finger of God My friend is photo-documenting Holocaust Memorializations before the reality of time sets in and they fade into a forgotten past by a forgetting present. What does taking a picture cost � gas, time, getting out of the house?